Disney is really not messing around when it comes to updating their parks. Not only is a Star Wars themed attraction, officially titled Star Wars: Galaxy's Edge coming to both Disneyland and Disney World, but there is also the new Guardians of the Galaxy: Mission Breakout ride, plus the newly announced Spider-Man and Avengers rides. If that isn't enough for you, how about the long-rumored Tron ride? That's right, after many months of speculation it looks like the Tron ride is making its way to Walt Disney World. The announcement was made by Bob Chapek, Chairman of Walt Disney Parks & Resorts, during the Disney Parks and Resorts presentation at the D23 Expo. The Tron Lightcycle Power Run attraction opened on June 16th, 2016 in Shanghai to rave reviews and there have been rumors persisting ever since that Disney was going to bring the attraction, or a similar attraction, to one of their domestic parks. That turned out to be true. For now, the attraction is only going to make its way to Disney World and not Disneyland, but that could eventually change, if the attraction is successful. According to Bob Chapek, the plan is to have the Tron ride open by 2021 so that it will be ready to go for Disney World's 50th anniversary. The ride is going to open in Tomorrowland next to Space Mountain in a brand new space that is being created to house the attraction. So, fortunately, the Tron ride won't be forcing any beloved rides out of the park in order to make room. As much as fans have enjoyed the Guardians of the Galaxy ride so far, there are many who were quite side to see the Twilight Zone Tower of Terror leave the park. Understandably so. In case you aren't familiar with the Tron Lightcycle Power Run from Shanghai, it sounds like a total blast. The roller coaster puts riders on their own Lightcycles, like the ones featured in the Tron movies. The bikes tear through the Grid at nearly 60 miles per hour, which makes it the fastest of any Disney roller coaster to date. As the Disney Parks blog puts it, the ride "offers access into the energy, lights and excitement of Tron's high-tech universe and is one of the most thrilling adventures at any Disney park." 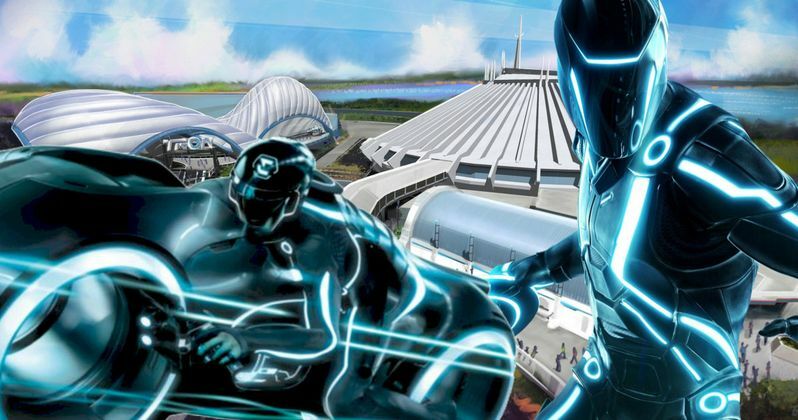 In addition to the announcement, the Disney Parks blog also revealed some concept art for the new Tron ride, which looks pretty epic and grand in scale, which you can check out for yourself below. This may also add some fuel to the fire that Disney is looking to reboot the Tron movie franchise, after the relative failure of Tron: Legacy, with Jared Leto being eyed to star. Imagine if they could time the ride and the Tron reboot to both open in 2021? That would be pretty awesome. At the very least, you will definitely be able to enter the Grid for yourself and ride a Lightcycle in roughly four years.